ATIMAGAZINE | BLOG: I-Tunes Festival With Jessie J! I-Tunes Festival With Jessie J! Today I wanted to talk to you about something I have always wanted to do and was lucky enough to get to go to last week. 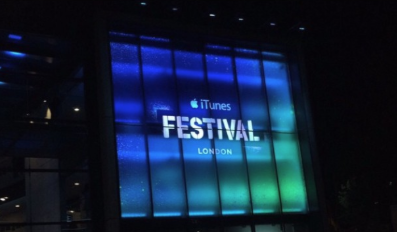 Of course that is the I-tunes Festival. Every year since the I-tunes Festival started I've applied for tickets and only won once which was for a band who I wasn't into so at the time I didn't end up going. The older I get, the more music influences my day to day life... so when my friend told me she had won tickets for Jessie J at the I-tunes Festival and invited me to go I was super excited! We arrived at the venue and had to wait around for an hour to be let inside, once we got inside we were directed to the top of The Roundhouse. We could not of had a better view from where we were standing. I had never been to The Roundhouse before however I knew it was an iconic venue and was blown away by the structure, sound quality and intimacy. This was my second time in seeing Jessie J live and she was just as incredible if not better then before. It is such an experience to be able to witness such talent in such an intimate setting and I always appreciate the smaller shows that such big artists do. Jessie performed a range of old and new song's. One of my favourite moments of the show was when she came to the front of the stage with her guitarist and did a small acoustic set with just her and a guitar. For me acoustic music is definitely my favourite, the raw, real, emotion it portrays gives the lyrics more essence and feeling then say a studio version. You can watch some of my I-tunes Festival experience here. You can also Pre-Order Jessie's third album Sweet Talker on I-Tunes!